Leaders, coaches, parents, and teachers worldwide are changing lives, teams, and families of all types. How? By applying potent discoveries of the last 25 years about how responsibility really works in the mind. 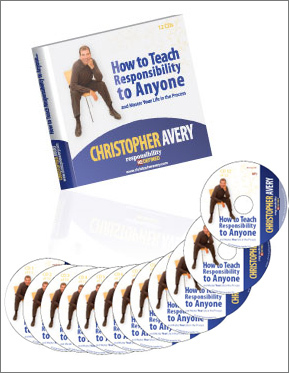 Recorded live at the inaugural session of Christopher's Global Educators Academy. And more. What results will you produce in your life when you have these skills? The critical—and poorly understood—distinction between "being held to account" in a role or relationship and "feelings of ownership"
Answering the critical question: "If we are hardwired to both avoid and take responsibility, how do we become so good at avoiding it, and so poor at taking it?" Debrief of Module 5 plus a discussion of the notion that what the media reports isn't necessarily "the news"
Evaluate How to Teach Responsibility to Anyone (and Master Your Life in the Process) for 60 days. If you don't agree that this product provides extraordinary value for your money, I'll refund 100% of your purchase amount. MP3 download. Buy the download version now for just $197.